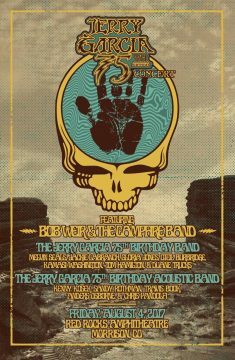 Join the Jerry Garcia Family in celebration of Jerry’s 75th birthday with a once-in-a-lifetime tribute to his life, legacy and enduring spirit on Friday, August 4th at Red Rocks Amphitheatre in Morrison, CO! The celebration will be led by Bob Weir & The Campfire Band and also features the Jerry Garcia 75th Birthday Band, an all-star band featuring original Jerry Garcia Band members Melvin Seals, Jackie LaBranch, and Gloria Jones plus Oteil Burbridge, Kamasi Washington, Tom Hamilton and Duane Trucks. The night will also include the Jerry Garcia 75th Birthday Acoustic Band featuring Kenny Kosek and Sandy Rothman of the Jerry Garcia Acoustic Band, Chris Pandolfi and Travis Book of The Infamous Stringdusters and Anders Osborne. Tickets to the Jerry Garcia 75th Birthday Concert will be available via a special fan pre-sale beginning on Wednesday, June 14th at 10am MT via http://jerrygarciafanticketing.shop.ticketstoday.com. Public on-sale begins Friday, June 16th at 10am MT via AXS.com.